From left to right Orvis Chairman Dave Perkins – Camp Bonaventure and Salmon Lodge General manager Junior St-Onge – Camp Bonaventure & Salmon Lodge Owner Glenn LeGrand – Orvis director of Eastern Endorsed lodges Scott McEnaney. 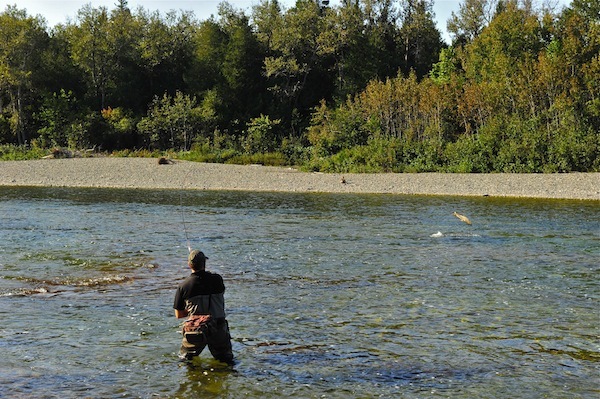 If you are thinking about fishing Atlantic salmon this summer or early fall—and, by the way, you should be thinking about fishing Atlantic salmon this summer or fall—you would be doing yourself a favor to visit the Web sites ofSalmon Lodge on the Cascapedia, and Bonaventure Lodge. Bonaventure Lodge, in particular, has been on my mind lately. That’s because I was able to sit down for lunch with Glenn LeGrand and Junior St-Onge, owner and general manager of Bonaventure Lodge and Salmon Lodge, respectively, and talk about the upcoming salmon season. Both men are excited about the prospects, as am I, because they are nearly booked out for 2013 and I already have my slot with them for September. 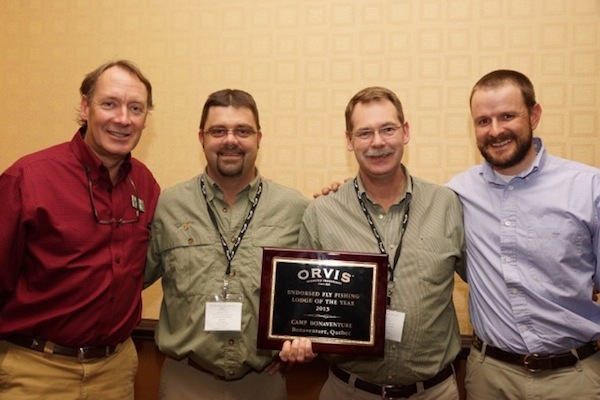 In addition, they were stoked to have been awarded Orvis’ prestigious Fly Fishing Lodge of the Year award. Well hell ya, those salmon jump a little higher in Quebec. I can say that Orvis’ recognition is well deserved because I had an absolute blast fly fishing for big Atlantic salmon while visiting both Bonaventure Lodge and Salmon Lodge last September. There were scads of fish in all the pools, up to a hundred or more in some places, and I managed to get some of them to eat, including a 20-pounder and one hen that weighed close to 30 pounds, among others. Well yea, a shot of Johnny Walker Red and a cigar taste better in Quebec (at 9 a.m.) than just about anywhere else. I’m telling you that those lodges offered awesome guides who could help you when needed it, but they knew enough to stay out of the way when they weren’t needed—as in nobody breathing over your shoulder all day, which I hate. 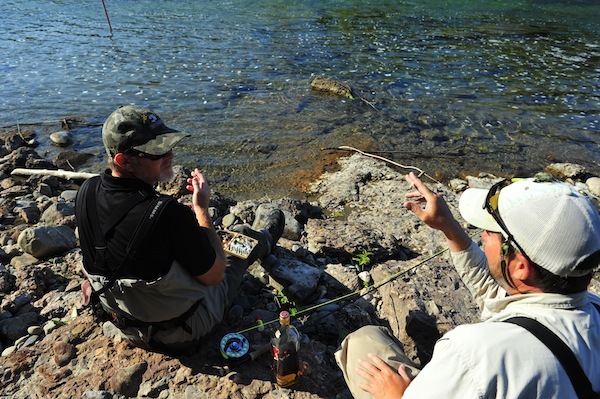 But these guides were cordial and fun to be around, too (Danny thanks for that Johnny Walker and the smokes!). Well, yea man. 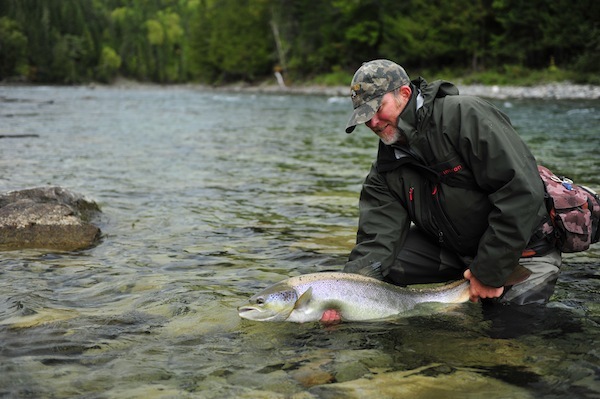 They grow to 50 pounds on the Gaspe and this one might have gone 25 or 30. Take that every day you know. Again, if you want to fly fish Atlantics on Quebec’s Gaspe Peninsula this year, you better give these guys a call right away and see if you can grab a spot before they’re all gone. Hope to see you on the river, hopefully with a big Atlantic jumping out front. We are very pleased to announce that our sister lodge – Camp Bonaventure has won the “2013 Orvis endorsed Lodge of the Year Award” This year Missoula Montana was host to the 2013 Guide rendez-vous and Endorsed Lodge retreat. Over 300 guides and a host of lodges participated in this annual event. Each year Orvis nominates a handful of lodges for this much coveted award. This year there were seven finalist from all over North America. The Endorsed lodge of the year award is based on how Orvis rates our lodge and by the reviews they receive from you, our clients. As a lodge owner I am very honored to receive this award, but most of all I am honored to be surrounded by a fantastic staff who are really the recipients. Only because of their dedication and hard work this was possible.